This series of family and individual pages with written Wells lineage is an extract of my direct line ancestors from a 10,000 person, fully linked database compiled since 1983. 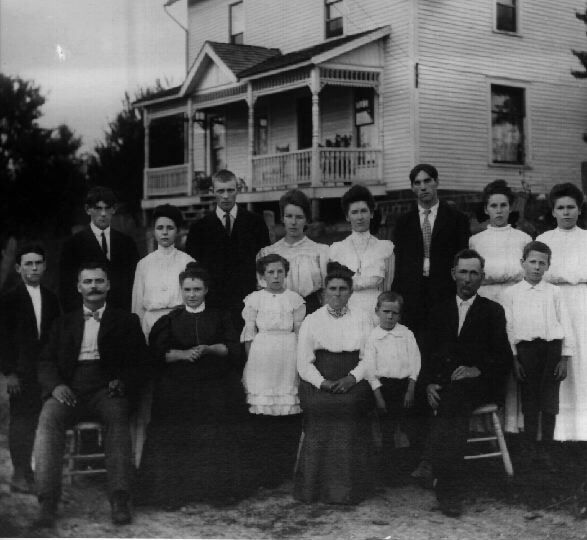 The photo below is my Great Grandfather's family, consisting of he & his wife, 9 children and their spouses, as well as his brother-in-law & spouse - taken in Sept 1907. The webpages on this site are organized into both family pages and individual pages as well as tree charts. It is possible to navigate up and down the family tree or via either page style. Note: The sources and references for the data are not shown in order to maintain focus and save space, as well as to encourage interested parties to contact me for more information, corrections or additional contributions. I am quite willing to share and exchange information with interested parties. The Tunis Wells Family History©of my direct ancestors, complete with notes,sources, etc. The name Wells is a local name, meaning "dweller by a well", or group of springs, coming from the old English word "Wella" or Middle English Well(e), meaning well. It would also have been used to identify people from Wells in Somerset, or the parish of Wells-next-the-Sea in Norfolk. The earliest records of this distinguished family name include Toke de Weiles, listed in the Pipe Rolls in Norfolk in 1177 and Roger AttewelI, recorded in the Curia Regis Rolls in Sussex in 1200. The ancient family motto was SEMPER PARATUS (Latin), meaning 'Always prepared". Name Meaning: Dweller at the spring or well. Variants: Wel(s), Welle, Weller, Wel(l)man. Population: USA 124th, 181,551; England & Wales 137th, 44,566. Noted of the Name: Herbert George Wells (1866-1946) English Reformer / Science Fiction Writer; Orsen Welles (1915-1985) American Actor / Broadcaster / Director; Mary Wells (1943-1992) American Singer; George Wells (1909-2000) American Novelist / ScreenWriter; Horace Wells (1815-1848} American Physician, joint discoverer of GeneraI Anesthetic c.1840. Copyright Notice All materials contained in these pages are copyrighted by Dave Wells, except where credited to another author, source or as specifically exempted. This copyright notice applies to files residing on or originating from the parent directory or subdirectories of the file "index.html" or its proxies. Dated materials are copyrighted as of the date noted. All other materials are copyrighted 1998, or the current year. Permission is granted to individuals (not corporations) to make a single paper copy of any material presented herein for personal, in-home, non-commercial purposes only. No additional copies may be made, either in paper or electronic media, without the express written and signed (on paper) permission of the author. Also, please be aware that I'm an individual researcher, and some information given could be erroneous, and is updated frequently and without notice. In other words, don't take my word for it. Always check and verify the facts for yourself. In general, we would all do well to respect the creative property of others on the Internet and World Wide Web. That people would so generously share their creative efforts in such a universally accessible way does not constitute a waiver of their right to determine how it may be used. Please ask for permission before using such material in a way that is outside the scope outlined above. And remember, if the author does not specifically call out material as copyrighted, it is still covered by copyright law, and should be assumed copyrighted. created using Reunion, from Leister Productions, Inc.